There’s not a whole lot to say at all about BC Racers, let alone a lot of good. 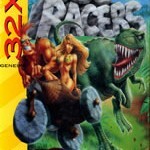 BC Racers is like various other 32X titles in that it represents the bottom of the barrel for this failed system. What wasn’t much of a quality title to begin with had been ported over to a system that didn’t have the horsepower to do it justice. And so as a result, many things went wrong that turned this into an instant flop. 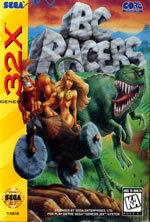 BC Racers, as is evident from its name, is a racer whose style makes it comparable to Mario Kart for the Super Nintendo Entertainment System, except here it takes place in prehistoric times. Fair enough. The box proclaims a total of thirty-two tracks to play, when in reality you basically have eight major tracks with four variations of difficulty for each track, making each one different in track design, but not different in substance. Each of the eight tracks has a different look to it, all keeping up with the caveman theme. You have a bedrock-style neighborhood, a dense jungle, a creepy cave with lava pits, a desert track, and various others. You have six choices of racers to choose from once you go past the boring and variety-less title screen to start the game. Once the choice is made, one character drives the kart while the passenger uses a weapon to attack nearby racers, but you control the both of them as one racer. You’d hit the gas with one button, and attack with the other, while your third button serves as a turbo booster which makes the kart speed up 30% faster for ten seconds or so. In theory, this seems to have the makings of a really terrific game, but all factors of quality gaming go a wry with this title and altogether make BC Racers a real stinker. Graphically, the game is pathetic, simply because this is supposed to be on a 32-bit console. It makes virtually no use of the 32X, other than the fact that it’s very colorful, but “very” is being extremely polite. The background art is 2D and not very detailed, the graphics are composed of ugly sprite animation that’s choppy and moves at a poor frame rate, and the characters are a bit pixelated so anything cute they might appear to be doing is hampered heavily by bad graphics. The 32X makes an attempt at scaling by giving you three choices of viewpoint which are all essentially from behind, just at different angles. But you have to pause the game to switch between them, which is kind of cumbersome. The track also scales acceptably as you twist and turn through the tracks, but again everything is just very ragged and choppy. The nighttime track in this game is a prime example of muddy animation, choppy graphics, and intangible visuals blended together to make this game arguably unplayable at times. The sound is abysmal. I think “abysmal” is also being very polite. The music is typical Genesis quality that you’ve probably heard in other titles. The sound effects are not only poor and annoying, but they’re filled with bugs. One of the genuinely fun parts of this game is the ability to run your car into spectators on the sidelines which makes them shriek and fly into the camera, using some basic scaling. But the sound effects seem to malfunction often, being replaced with little static shock sounds. It might fool you into thinking your speakers are blown out. Also, the skidding of your “rock tires” is so incessantly repetitive that it’s all you can hear through most of the game as you swerve around every corner, and it almost makes you forget there’s music playing. The sounds of hitting other players is also quite annoying, and every sound in the game seems to be represented by the same exact sound effect. The gameplay is very uninspired. Along the road there are no power ups, no special items, nothing that would keep things interesting and add variety to the gameplay. And except for the occasional ramp you have to hit to make it over some hazard, all you do is skid around turn after turn without anything to show for it and as a result, the game starts to feel very dull. BC Racers features a two-player split-screen mode which, as you can imagine, is about as fun as the actual game itself. The thought of the 32X pulling off a split-screen mode when it can barely handle a single-player game is not a happy one. Surprisingly, it pulls it off as well as the single-player mode, but what’s not so surprising is that all the buildings, sprites, and everything else have been removed from the field so it runs smoother. That really sums up the game. It’s graphically disappointing, the collision detection with anything is nonexistent so you can barely tell if you’re going to knock into something, and crashing into too many things wrecks your bike and forfeits the game. BC Racers makes use of a couple of continues when that happens, and when you exhaust them, you get a game over. The sound is horrible, and the gameplay is as shallow as a kitchen sink. Frankly, this was a great idea for a game and could have been a cute title. But on 32X, this game can’t even handle itself properly to make it amusing or fun. And even if it could, there’s not enough substance to make BC Racers worth your time.